Where do I go from here? It's a question all students ask themselves approaching graduation, and one that is particularly important for students who have devoted five or six years to a PhD. The answer, it turns out, is anywhere. In a first-ever survey of PhD graduates from the University of Toronto, the School of Graduate Studies found that alumni who graduated between 2000 and 2015 are working in 97 different countries, with careers ranging from neurosurgeon to user-experience researcher. About 60 per cent of graduates across all disciplines found work in academia, and roughly a third hold tenure-stream positions. However, the data suggest PhD graduates are increasingly ending up outside the academy. Comparing the cohorts of 2015 to 2000, nearly twice the proportion of PhDs were employed in the private sector (23 per cent as opposed to 13 per cent). The project was initiated by Professor Reinhart Reithmeier, with support from former Dean Locke Rowe. Researchers compiled the data using internet searches of open-access data sources, such as official university and company websites, to determine a PhD’s current employment. They found the professional outcomes of nearly 10,000 former students, or 88 per cent of graduates, over the 15 years covered by the study. With the help of U of T’s Institutional Data Hub, SGS then created an interactive dashboard that allows users to customize their exploration of the data. The list of current private-sector employers reads like a who's who of top companies: Google, Intel, Janssen, RBC and Scotiabank figure in the top five. PhD graduates in the post-secondary sector can be found everywhere from Canadian universities to the National University of Singapore. In the public sector, the top employers included the University Health Network, the Hospital for Sick Children and the Centre for Addiction and Mental Health. Barker, whose own PhD focused on Indonesia during the dictatorship of the 1990s, says U of T graduates with advanced degrees are well positioned to find jobs in new and interesting fields. “Toronto is emerging as one of the hubs of the knowledge economy, and the specialized training PhDs acquire can play a big part in elevating and expanding innovation locally and globally,” he says. The data show how U of T contributes to a “brain gain” in Canada, with nearly half (46 per cent) of permanent residents and international students finding employment here. The study is not the only good news U of T has received about the future prospects of its graduates. 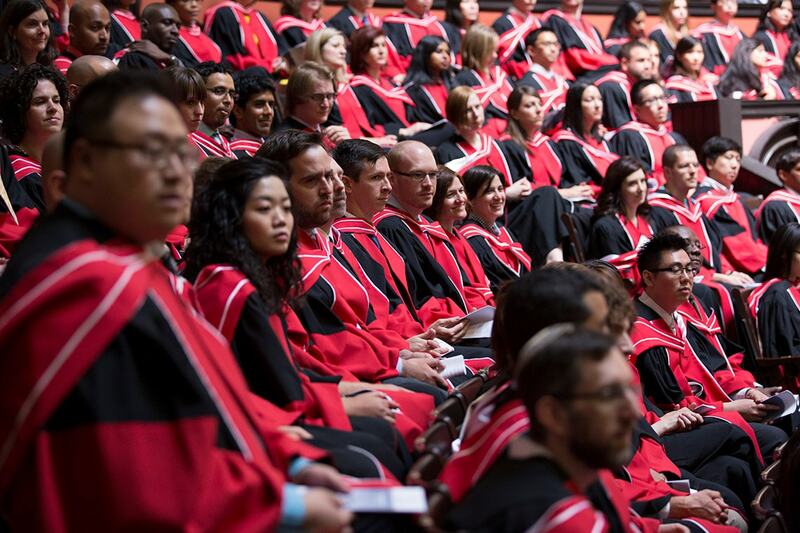 Over the past several years, the university has consistently led other Canadian institutions in Times Higher Education's global university employability rankings. U of T News went beyond the numbers by speaking to four PhD graduates and one current student, Hadiya Roderique, about their time here, why they pursued a PhD and how it has prepared them for the future. The similarities between the human brain and artificial intelligence are often overstated, Givoni says. But in her case, an early fascination with neuroscience preceded her interest in machine learning. In high school, she became interested in one of the body's great mysteries: brain functioning. She grew up aspiring to become a neuroscientist, and spent a summer in a lab studying the rat's visual cortex. That goal led her to U of T, a world leader in the field. She was paired with her adviser Professor Brendan Frey, the founder and CEO of startup Deep Genomics, which uses machine learning to develop genetic medicines. She graduated in 2011 and now applies her research to her work as an autonomy engineering manager at Uber in Toronto. Over and above technical skills, she says she learned to be her own boss. Marshall says she wouldn't be the writer she is today if she hadn't pored over medieval manuscripts in university. Her first book of short stories, Hair Side, Flesh Side, takes its title from the animal skins used for parchment. The collection includes Blessed, the story of a seven-year-old girl, Chloe, whose divorced parents give her the bodies of saints in an eerie game of one-upmanship. It starts when Chloe receives the body of St. Lucia of Syracuse as a birthday present from her dad. “It was rough like a cat's tongue in some places and smooth as fine-grained wood in others where the bone peeked through,” Marshall writes. Not to be outdone, Chloe's mom later gives her the body of Joan of Arc. At U of T, she was part of a writers' group with students in medieval studies and literature – including Kari Maaren, who published her first novel last year. There was never any doubt in Planinc's mind: She wanted to be a professor. After studying literature and philosophy at U of T as an undergrad and then taking a master's in political science at McGill University, she returned to Toronto for a PhD in political science. “Devoting six years of my life to the PhD always felt like a cost I was willing to bear because I thought I couldn't be doing anything else,” she says. “There is a big transformative moment when you're doing your PhD,” she added, which begins with writing your thesis proposal. The degree gave her the time and freedom to think deeply about the subjects that interest her, including 18th-century French philosophy and natural science. Her dissertation is the basis of her in-progress first book, Regenerating Political Animals, which situates the “Declaration of The Rights of Man and of the Citizen” from the French Revolution within the context of contemporary science, theology and philosophy. In a way, she's come full circle to her interests in literature and philosophy, having recently accepted a tenure-track position as an assistant professor at the University of Notre Dame in the liberal studies program. In addition to political theory, she will be teaching canonical books like The Odyssey. She starts her new job this fall. Selvanayagam spent part of his PhD working on an idea that sounds straight from science fiction: an invisibility cloak. He and his supervisor, electromagnetics Professor George Eleftheriades (above, right) in the Faculty of Applied Science & Engineering, developed a device that can hide a metal cylinder from radar detection, or make the cylinder appear smaller, bigger or plastic. Selvanayagam, who now works for a quantum-computing startup in Berkeley, Calif., says he was able to divide his time doing his PhD between “pie-in-the-sky” ideas, like the cloaking machine, and more practical things. He and his supervisor took concepts from their cloaking demonstration – on microwave lensing and microwave polarization – to build systems with implications for satellite imaging and communications, Selvanayagam says. Roderique, a U of T law graduate, is now pursuing a PhD at U of T. She was one of only five Black lawyers at a prestigious Bay Street law firm. Her time working in law, which she describes in a widely read Globe and Mail piece, left her feeling like she didn’t belong. Questions that arose from that experience led her to quit her job and pursue a PhD at the Rotman School of Management. She expects to defend her thesis this summer and has already lined up interviews with top consulting companies.